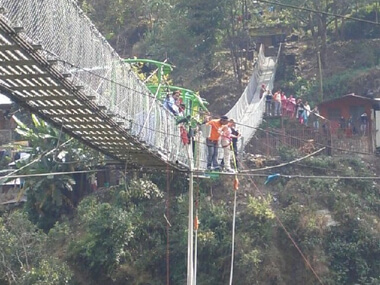 The first bungee jumping site of Nepal is situated 160m above the wild Bhote Koshi River. This site is quite close to Nepal-Tibet boarder and it is three hours drive from Kathmandu valley. There is only one agency that offers this sport. This jump was first designed by the one of the leading bungee consultant of New Zealand. And it is run by some of the most experience jump master in the business. The agency puts the safety in top priority. From Kathmandu valley, it takes less than three hours to reach this site. You travel in Araniko highway to within the 12 km of Tibetan boarder and the friendship bridge. There is a 166m wide steel suspension bridge over wild Bhote Koshi River and it is the place where cross culture trekking takes place. This bungee jumping site is designed by the Swiss people with a 4x safety factor. This bridge is supposed to have a loading factor of 250kg per running meter. It meant that the bridge hold 250 x 166 = 41,500kg or 4.5 tones. Over 6000 meters, the still wire is used to build the longest suspension bridge in Nepal. This bridge connects two sides of the great valley. Local inhabitants used to walk for five hours to cross this river gorge before this bridge was constructed. Imagine a bridge 160 meters above a tropical gorge with the Bhoti Koshi River, one of the Nepal’s wildest rivers raging below; close your eyes and JUMP!!! This place is situated at three hours drive outside from the Kathmandu valley and 12km away from the Tibet board. This bridge is said to be the only privately owned bridge in Nepal. It is designed specially for bungee jumping with 4x safety factor and has a leading factor of 500 kg or 4.5 tons according to Swiss measurements. One should have the insane or suicidal twist to jump off remarkable height. You are suggested not to take any intoxicants before the jump. You are also strongly advised to empty the pockets before that. You need to weigh before you make a fall. You can also use different cords for different categories of weight. The green, red and black cords are used for the lightest, the heavier and the heavy weight accordingly. The Adrenaline starts to rush in your body as you jump.